Stumps are stubborn, and they can be a real eyesore and inconvenience. 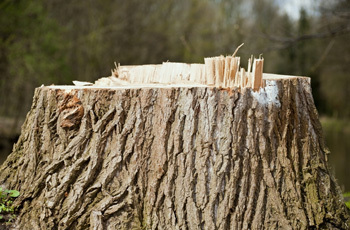 If you have a leftover stump sitting in your yard, or a recently felled tree with a stump, we can remove it. We use a specialized machine, called a stump grinder, to grind through the dead wood of your stump. Let’s talk about the stump grinder, and our process. A stump grinder is a heavy-duty, highly specialized machine. The grinder and engine are set atop wheels which move the machine into place. Our grinder features a metal blade with strong “teeth” which are designed to chew through wood once the blade is up to speed. A stump grinder is a very high-power machine, and it requires proper training and precaution to perform a grinding safely. After putting the grinder in place, our team will suit up with the proper safety gear (including eye protection and ear protection—the grinder is loud and it can kick up wood chips. Then, it’s time to turn on the blade. Since stump wood is especially dense and knotted, grinding through the wood is actually a rather slow process. Once the blade is engaged, the grinder blade is slowly lowered into the stump in a fashion similar to lowering a chop saw (or miter saw) blade into a piece of lumber. However, the stump grinder is also designed to move from side to side, sweeping the blade over the surface of the stump an inch or so at a time. The blade is lowered, the grinder sweeps a swath of cuts horizontally across the surface of the stump, and then the blade can be moved backwards or lowered to cut further into the stump. This process is repeated until the exposed portion of the stump is removed. We can even grind several inches beyond the grade of the surrounding landscape so that topsoil and sod (or other landscaping materials) can be placed. Our tree care services don’t stop at stump grinding! You can count on us to fell your tree as well as grind its stump, so that you can completely remove your tree in one fell swoop. We do our utmost to improve your landscape. Our team is based right here in Northern Colorado and we provide tree care services for folks throughout the Front Range. Get in touch with us to learn more about our tree care services or if you’re ready for a free quote on your upcoming project!